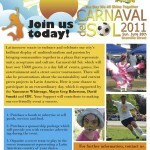 The 3rd annual multicultural “Carnaval Del Sol”, will be held on June 26, 2011 in Downtown Vancouver. Over 15,000 attendees are expected. The event takes place on June 26, 2011 on Granville Street between Smithe and West Pender (the street will be closed to traffic) and will have a “Sustainable Development and Latin America” section. Dr. David Suzuki and the Vancouver Greenest City Team will be present, as well as other organizations involved in sustainability locally and in Latin America. Also, university students will be presenting their research work on sustainability in Latin America.